Wash and core your apples, but leave the peals on for some yummy added fiber. 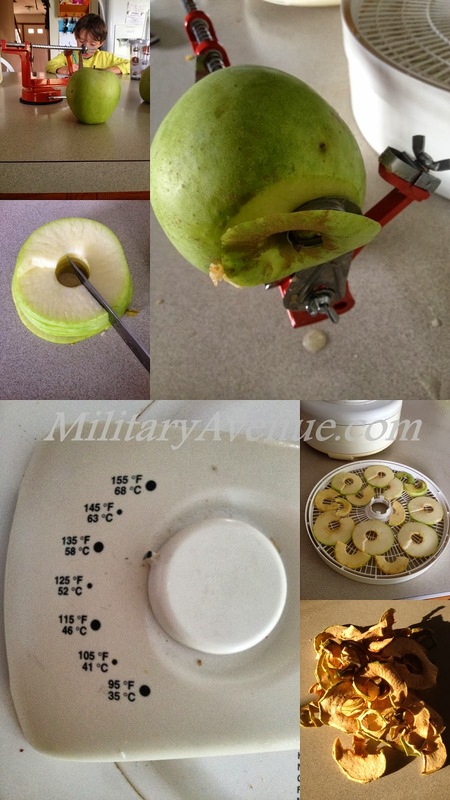 If you use a corer similar to mine you can simply push the peeler-arm back and it won't peel the apple but it will core it and slice the apple into perfectly sized pieces. Lay the apple-slices out on a dehydrator tray in a single layer. You may want to cut some of the pieces so that they fit (from full circles to half circles). After your trays are full, 4 or 5 apples, of course that depends on the size of your apples and how many trays you have, set the dehydrator temperature to 135o F.
Set the dehydrator out of the way and let apples 'cook' for about 8 hours. You can make these right before bed and they'll be ready in the morning. When they are done they will not be soft anymore but a nice crispy apple-chip. Bag apples into ziplock bags and insert into package. You may want to put a little bubble wrap or other packaging material so they don't get too crumbly, but they travel pretty well and should last three or four months in the sealed bag. You military-member will have a healthy snack, a reminder of home, and less-packaging - more love. You can do a lot more then apples on a dehydrator. Here are other ideas from an earlier post. 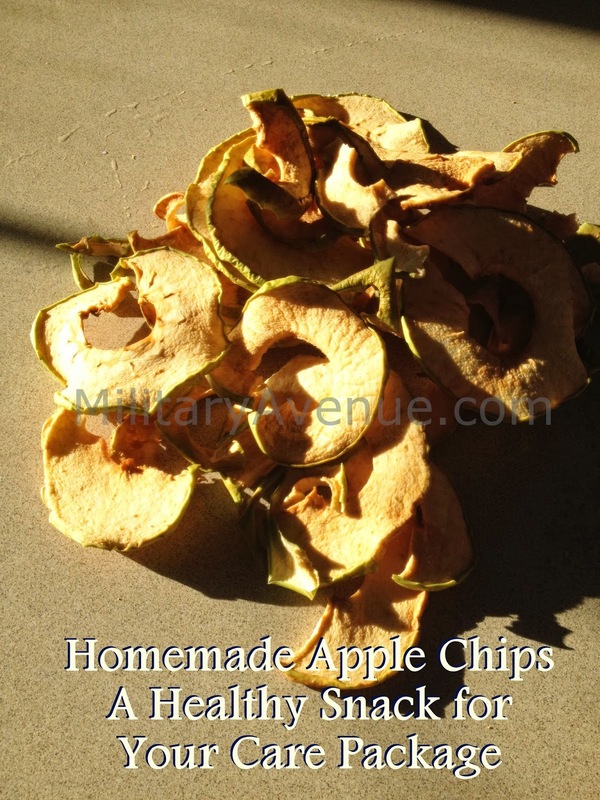 Dried apple chips is a much healthier snack than potato chips we normally eat. Thank you so much for this informative post. I found your site as a perfect platform to get good contents to read. I would love to say that the contents which you are sharing in your site is very opt and easy to understand. This factor makes the reader to refer your site more and more. Keep the same quality in the rest of posts which is the best thing I have got from your articles. I am a writer at best essay writing service and all these articles helps me a lot. Thank you.